The beginnings of a forest are underway. Underneath the myrtles are random scatterings of seedlings and plantings of cuttings. Strays from friends gardens and grasses coming up from out of the manures. Much of the barley grass that is growing has kept the g-pigs in fresh feed for several months. Initially they would not venture past the concrete edging when we let them run around the pot plants but now, the end of July they are less cautious and are delighted when they can make a run for the miniature forest that is growing there. 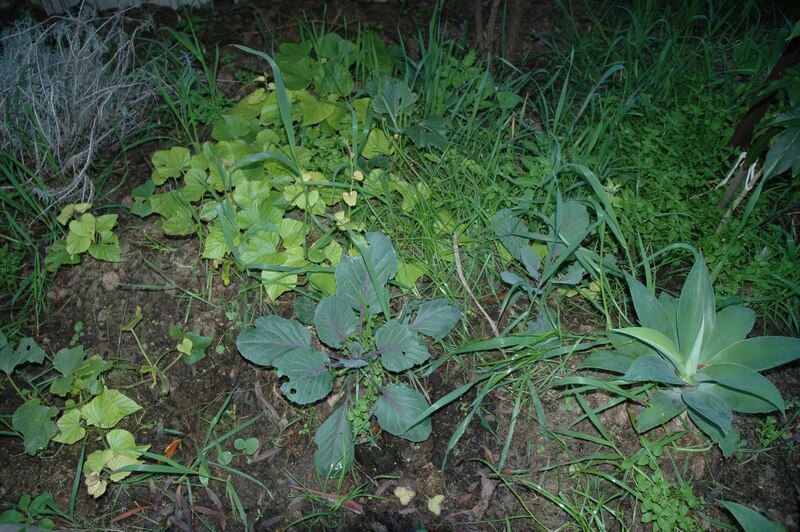 The picture above shows the types of plants that are making their presence known in the garden. There is sweet potato vine from cuttings and also from the ends of tubers started in the kitchen. Agave from a friends garden which will probably be moved into a pot once it grows a little more. Barley and wheat grasses. Cabbages and carrot tops that were from organic carrots from our local farmers market. To the far right is a Sapote tree that I nurtured in a pot until I found a spot for it and just behind that is situated a Tamarillo which was about two foot high in summer and was pot-bound and looking really sad at the local nursery so I felt sorry for it and brought it home. It is now nearly 7 foot tall in the space of 5 months and I am hopeful that it will fill the gap in the trees to mask out the house being built behind us adding privacy for them and us. At this stage the far back garden looks unruly, untidy and really rough, but it has been busy creating a nice soil structure so that come spring I can introduce a few more plants without threat of water just running off the sand like it was at the beginning of the year.